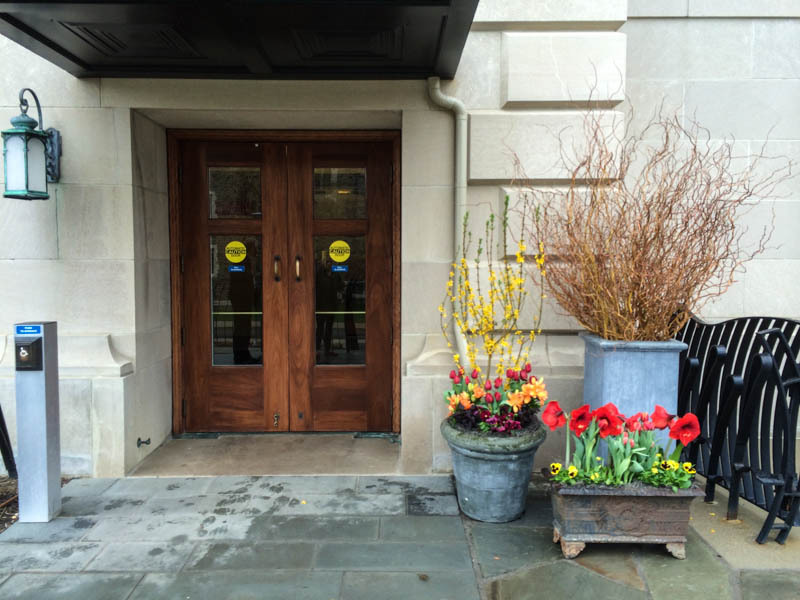 This weekend McCullough’s loaned containers for the Columbus Museum of Art’s Art in Bloom event. Placed next to the museum’s entrance, the containers nodded to both the Art in Bloom event and the current exhibit Toulouse-Lautrec 1880 – 1910 Paris. We took influence from the vibrant color of Toulouse-Lautrec’s artwork and deco cast iron to compiling the flowers and containers we used. Even though the containers are created using traditional spring plants (plus some amaryllis we had blooming in our greenhouse), combined in a small 3′ x 5′ area, the impact grand compared to the same flowers often lost in the landscape bed. Sometimes coming out of a long cold winter going overboard with color is required. The grouping of three different containers allowed us to fill the entire vertical area will color. The curly orange willows in the tall background container allowed us to provide height that is often difficult to get in containers. 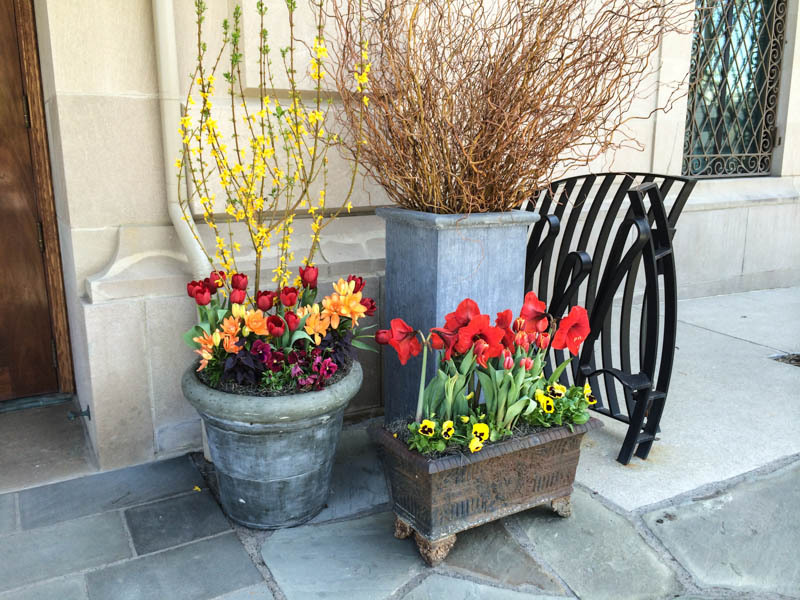 This rusty cast iron planter with its decorative feet and crest gave us some history to the grouping of containers that lean more to the traditional and modern design. The low height grounds the grouping with the rich reds and yellows. 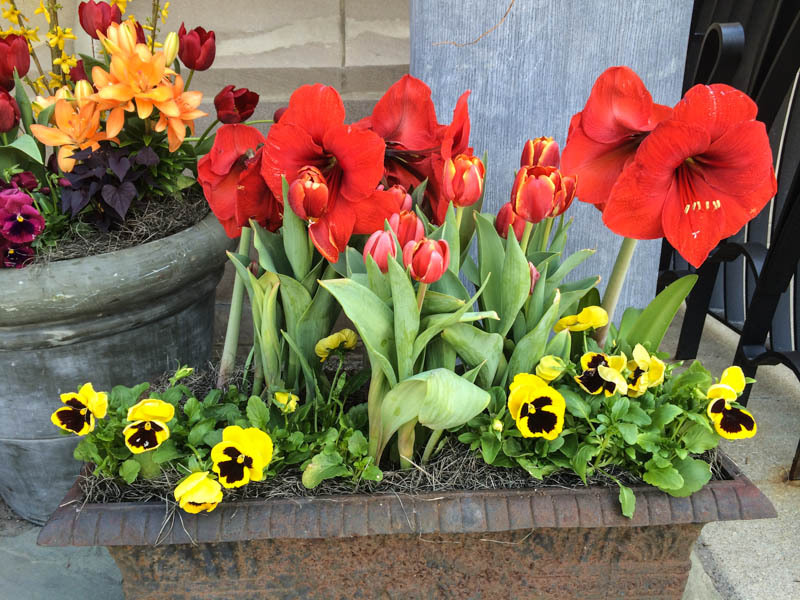 The amaryllis are a off season flower, but the large trumpet flower looked right at home with the tulips and pansies. We added only two lily plants to this container, but provided the hit of orange to reference the curly willows. 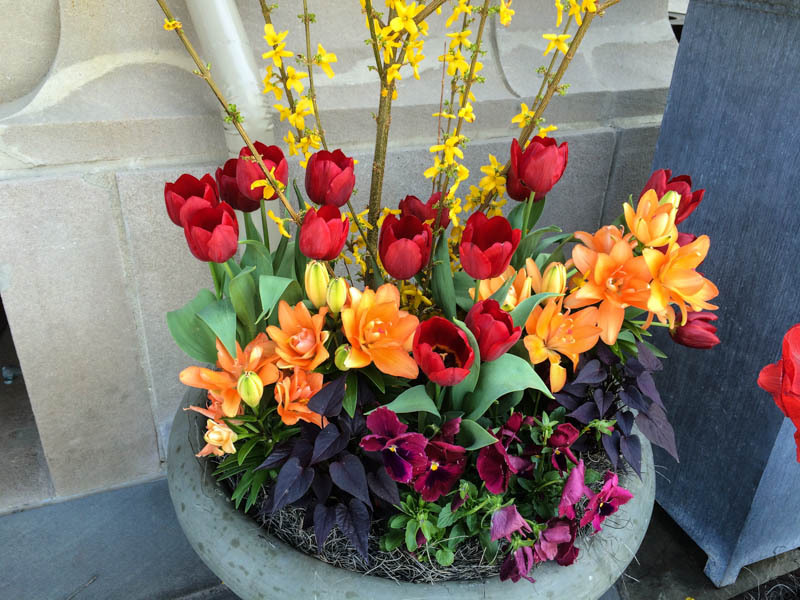 The deep red tulips, dark pansies and sweet potato vine reference the low cast iron container while the yellow forsythia bridges the height between the tall curly willows behind. Here is the containers next to the door for full scale and impact. These containers are good advocates for investing in containers for home, business or event entrances. They are a small investment with huge impact. This entry was posted in annuals, C O N T A I N E R S, Central Ohio, container, G A R D E N S, Landscape Design, McCullough, My Work, Ohio, Redtwig Farms and tagged Art In Bloom, central ohio, CMA, Columbus, entry way containers, garden design, Ohio, Plant Combos, Planters, red twig dogwood, willow curly willow, Winter Planters by Nick. Bookmark the permalink. Loved your blog, it took me two days to get through the whole blog , but I loved it. Got lots of good ideas too! Ill be looking forward for more posts to come. Thanks for sharing your knowledge and enthusiasm and time. Im from Michigan living in Holland so this was abit of a trip back to the states for me too , seeing the pictures of Grosse Pointe its in the near area I grew up. Have a great summer ! Thank you so much for the comment- I am so jealous, I love Holland and would love to spend some extended time there! But as you know, I do love the Midwest as well……Grosse Point and Birmingham are a couple of my favorite places!